The Abeka Home School Curriculum provides a traditional, academically challenging, homeschool program to families and schools. Many families choose their resources for the academic and spiritual appeal. Their homeschool materials cover nursery grades through high school. They also offer an accredited college program through Pensacola Christian College, which continues their accelerated style of learning after high school graduation. Examine the table below to see some of the pros of homeschooling with the Abeka homeschool program and see if it offers what you need. An Abeka homeschooling experience is sure to be one of rigorous study and exploration. Although it may not be very "hands-on" or activity-based, this academically challenging homeschool curriculum continues to offer many families a solid Christian education. Your children will be challenged with the Abeka books and you will likely learn right along with them. This can be a positive or negative experience for your child so be sure to choose wisely and determine if this program suits his/her learning style. Abeka books have interesting stories in their reading and literature books which your children will enjoy reading over and over again. Their science resources are full of relevant facts and information that promotes a Christian viewpoint. 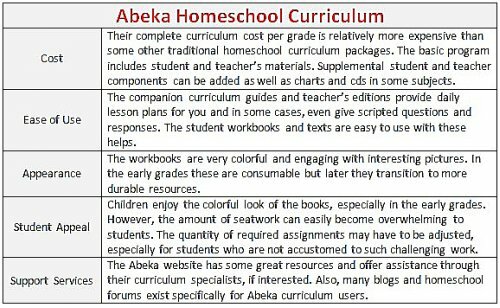 In addition to households and private, Christian schools, Abeka's homeschool curriculum resources are also used by many homeschool tutorial groups and co-ops. These books retain great resale value and are often found at used homeschool curriculum fairs. I hope this table is helpful to you in determining the best homeschool curriculum to use for your family or homeschool group. Abeka is not the only choice but it can definitely be a good choice for many families. Click here if you are interested in learning more about math, science or phonics resources from Abeka.